The way a pasture is grazed has a major bearing on the species that survive and dominate. Grazing strategies can be developed to maintain the desirable species and optimise their growth rates. Different grazing methods can also be used in more of a tactical, or short-term way to manipulate the composition of degraded or weedy pastures, reducing the need for herbicides or costly renovation. The way a pasture is grazed also affects how evenly nutrients in dung and urine are distributed and recycled throughout a paddock. Sheep camps can be minimised and maintenance nutrient requirements can be reduced with the appropriate grazing system. Understanding how the desirable species grow helps you plan a grazing system that will encourage these species to become more dominant. Likewise, knowing the weak spots in a weed’s lifecycle helps you plan grazing tactics to decrease their level in a problem paddock. For persistence, plants are most vulnerable during establishment and reproduction (flowering). For more information about matching plant growth and grazing management, see tool 7.5. For pasture assessment tips, see tool 7.6. Establishing an effective process of grazing management is about tailoring the principles outlined in this procedure to meet your personal and business goals. There is no ‘right’ grazing management and considerable flexibility is needed to continually re-balance the needs of soil, pasture and animals. Assess your pastures to determine if your current grazing system is limiting the growth and persistence of desirable species. A number of pasture assessment techniques are described in tool 7.6. For mixed pastures (annual or perennial) based on introduced species, a good composition is: 60% desirable grasses, 30–40% clover and 0–10% weeds. 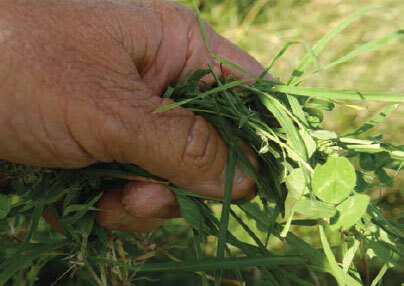 Note: for native grass-based pastures, the optimum clover content is 20% or less. Clarify the particular requirements of the species you have in your pasture, especially those that you want to increase or decrease and apply the appropriate grazing management as outlined in tool 7.5. Note: most pastures are quite complex mixtures of species, and individual compromises for each paddock will be required. Measure, manage and monitor the impact of your actions on pasture composition. Monitor and record paddock management actions and changes in pasture composition using the MLA Pasture Health Kit (see signposts). Ensure your actions, eg, changed grazing pressure, fertiliser rates, tactical herbicide use, etc, maintain or increase the proportion of desirable species in the pasture. Plants are genetically programmed to maintain a set ratio between their shoots and their roots. When leaves and stems are removed by grazing, the plant sheds root material to re-balance the ratio. 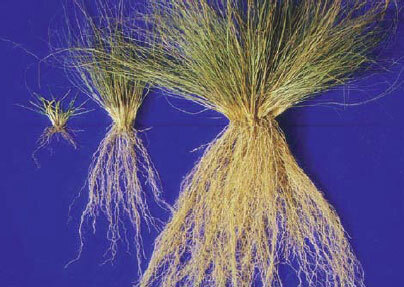 So, short, continuously grazed grasses will have small root systems like those on the left of the photo in figure 7.3, while pastures that are grazed and allowed to recover look more like the plant on the right hand side. All perennial species will be more productive and persistent under grazing that includes rest periods between periods of grazing. Growth rates of annual grasses such as annual ryegrass can also be improved by rest but their persistence in a pasture obviously depends on seed-set in spring, rather than survival of individual plants over summer. Deferred grazing is a tactic where livestock are excluded from pasture areas after the autumn break to maximise germination and establishment of pasture seedlings. Sheep can be concentrated into ‘sacrifice’ paddocks or laneways and hand fed. Sacrificial paddocks should have low erosion risk and you may need to pay extra attention to animal health. The length of deferment should be governed by pasture growth but, to be worth the cost and effort, grazing is best deferred until pasture has achieved at least 500 kg green DM/ha or, even better, 800 kg green DM/ha. The more green material (pasture residue) you leave after grazing the faster the regrowth, as photosynthesis is more quickly restored. During the growing season it is ideal to leave about 800 kg DM/ha (green material), but this is not always possible. This is also dependent on animal class species and leaf number. If you cannot leave 800 kg/ha then place a higher priority on significant rest periods to encourage regrowth. Resting pasture after the autumn break to let new seedlings establish. The exact tactics for other perennial grasses, including native species, are not so clear. As the soil seedbank contains few perennial grass seeds, allowing seed set will be necessary for recruitment of most perennial grasses. Trampling by sheep to encourage seed/soil contact may help, along with reduced grazing if seedlings emerge. Rest periods are also necessary for perennials such as lucerne to accumulate root reserves for growth persistence. MLA Tips & Tools: A large number of titles are available including: the MLA pasture ruler, grazing management of native pastures, phalaris, perennial ryegrass, fescue, cocksfoot, sub clover, tagasaste and kikuyu-based pastures. EverGraze Fact Sheets: EverGraze is developing and testing new farming systems in different environments across the high rainfall zone of southern Australia. The target is to increase profits of sheep and cattle enterprises by up to 50% and at the same time improve water management, use of perennials, biodiversity and soil health. Download the following EverGraze Fact Sheets at: www.evergraze.com.au/library-content/pastures-for-place-and-purpose-online-evergraze-exchange/ and scroll to the bottom of the page.